The Galaxy Note 7 recall is running full steam ahead and brand-new replacement units from the revised batch are about to hit the US tomorrow. However, there has been some confusion as to how to identify the new Note 7s recently. Initial reports said that the revised units come in a box, which has a special S sticker located near the IMEI and barcode numbers on the bottom of it. However, when users in Canada started getting their new Note 7 phones, there was no sticker, but a black square at the designated spot. Additionally, Samsung said that the new phones will have a green battery indicator in the notifications area. Yes, users on Reddit are saying that their recall-replaced Note 7 units have the plain, old white battery icon. However, Sammy clarifies, that the new battery indicator will come via a software update, which we assume is to be pushed over the air soon. Now, Samsung has come out with an official statement. 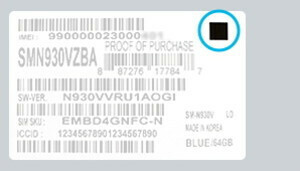 It seems that the black square symbol next to the barcode is the definite way that revised Note 7 units are signified. Some markets may have a circular sticker with a blue S, but that's not mandatory. Also, despite reports claiming that the battery indicator on new Notes is still white, Samsung stands by its announcement that revised units will have a green battery icon — on the notifications bar, on the always-on display, and even on the power key menu, as shown in the screenshots below. Of course, we do suggest that, no matter what unit you get, you should run it by the official IMEI checker as well — just in case. I follow about 10 smartphone news portals daily. PA has written more articles about Note 7 than the other 9 portals that I read combined. We get it PA. We get it. PA has become literally obsessed with the Note 7 recall. They believe that by constantly hounding their few readers with the Note 7 recall, they can dissuade them from buying Samsung phones in general. PA is just a get together of juvenile minded apple fanboys with little meaning to their lives except a hatred for Samsung. Phonearena now have become the iZombie since they ate the infected rotten Apple. Even though Samsung is trying to settle the problem, they still seem to be skeptical and negative perspective against Samsung. How about articles about Apple, they praised iPhone 7 in every aspects, they even bashed users who complained about 3.5 headphone jack that Apple eliminated. This is the true color of Phonearena, they aren't a tech site, but just a cheap Apple' puppet/slave. I'm going to end my account today, and to all the truely nerds, let's do it all together. They don't need us, Android fans anymore. They only run this site to satisfy the iFans by endorsing their master Apple. PA is literally swimming in mediocrity—an,unashamedly so. What do I do but ignore their utter ineptitude? Its becoming so boring now.. You keep repeating the same thing with a very minor addition in every new article about the Note 7 ! !